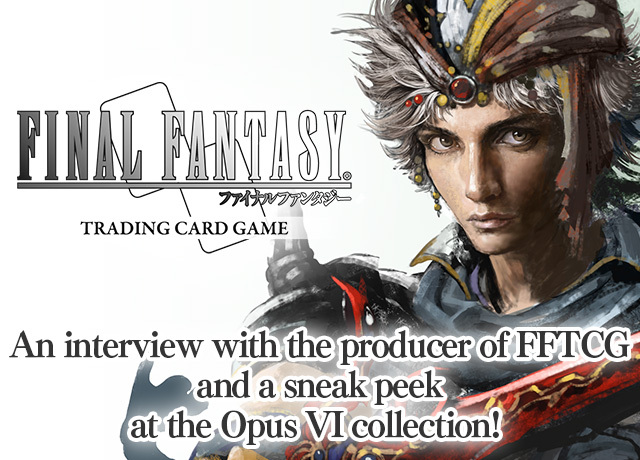 Interview with the FFTCG producer & Opus VI collection sneak peek! 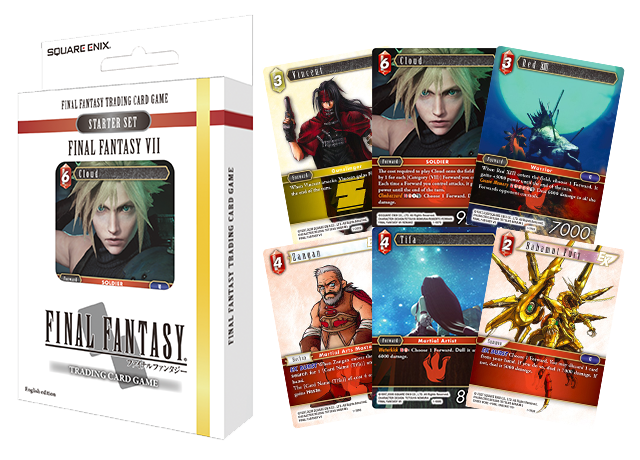 The FINAL FANTASY TRADING CARD GAME (FFTCG) is a global hit. With the newest collection, Opus VI, slated to be released in July, we asked the producer about the game and what makes it special. 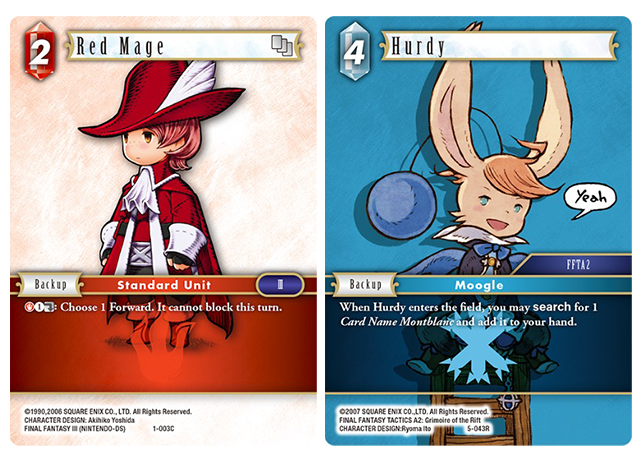 We’ll also introduce three cards from this new collection in an FF Portal exclusive sneak preview! 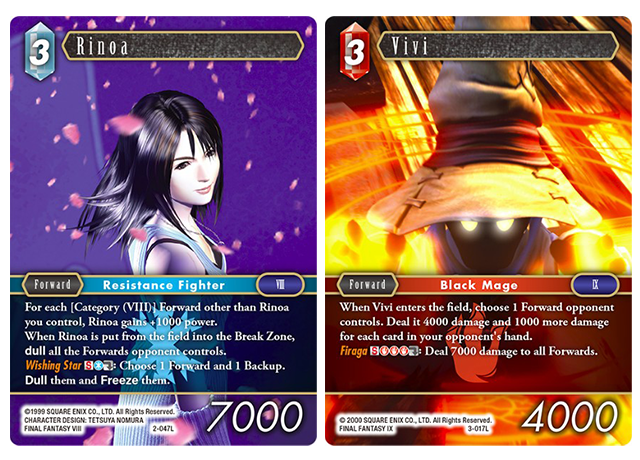 FFTCG is a one-on-one tactical card game featuring FINAL FANTASY characters and summons. 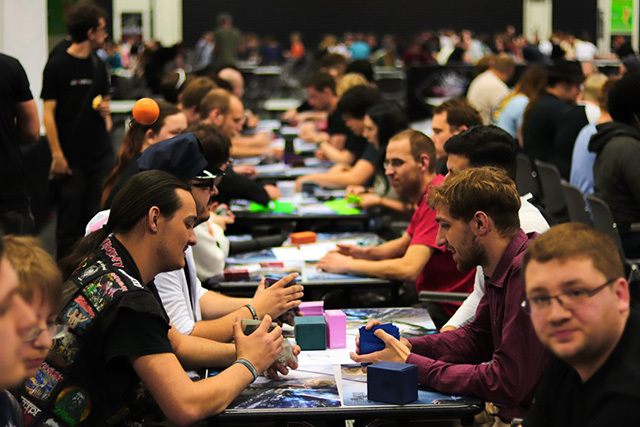 Not only is there fun in collecting cards featuring familiar faces, the main draw of the game is the simplicity of the rules combined with the complexity of the gameplay. We asked the producer of FFTCG, Mr. Kageyama of Hobby Japan, about the game and what makes it special. As chief producer of Hobby Japan’s Game Development division, Mr. Kageyama is not only involved with the development of FFTCG, but all analog games, including card and board games. FFII was the first game he played in the FF series. 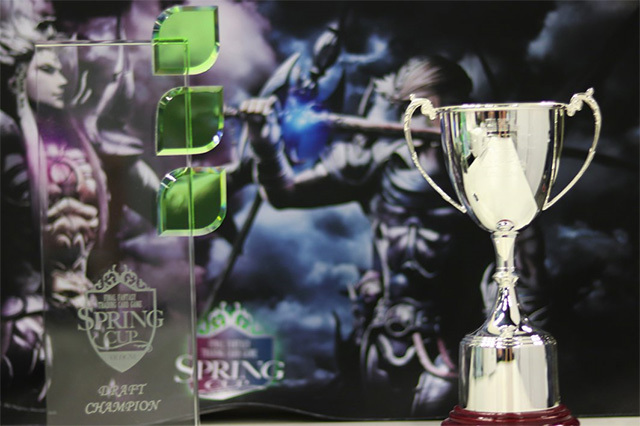 ――What kind of game is FFTCG? It’s an analog trading card game, a much different game compared to the main FF titles. Players go up against a single opponent who they attempt to defeat using FF characters. The first thing players do is collect cards of various roles to create a deck, and they use that deck to fight other players. The game has an all-star cast featuring characters, summons, and monsters from the FF series, with a goal to eventually include all titles. It’s similar to DISSIDIA FINAL FANTASY in that regard. In fact, FFTCG features a wider array of characters. ▲ As of June 1, 2018, the game features 35 FF titles! It even features original art. The FF series contains many titles. I’m sure a lot of fans have a favorite; FFTCG also caters to these players. Starter Sets, decks recommended for beginners, all have a single FF theme. For example, the FFVII Starter Set features the characters of FFVII as the main players. 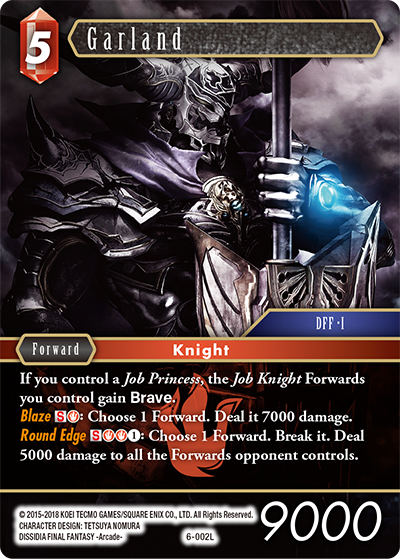 Not only that, FFTCG has a unique element that links cards together when character cards are played on the field, depicting their relationship in their respective games. While the FF series is played all over the world, so is FFTCG. It’s available in seven languages. 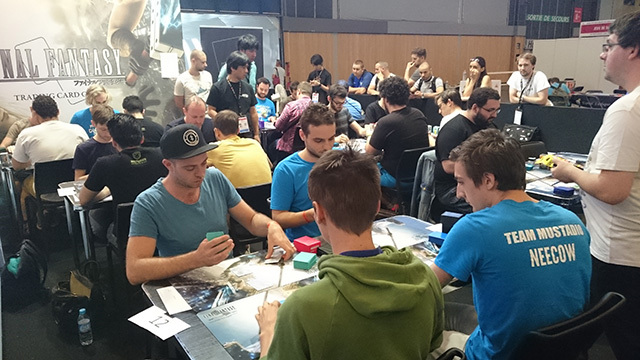 There’s a big player base in Europe, a region where analog games are popular. Of course, many players pick up the game because of the FF brand. At overseas’ game conventions, people come to get a peek at what this FF game could be. ――What kind of cards are used? There are four types of cards in FFTCG, all with different roles. 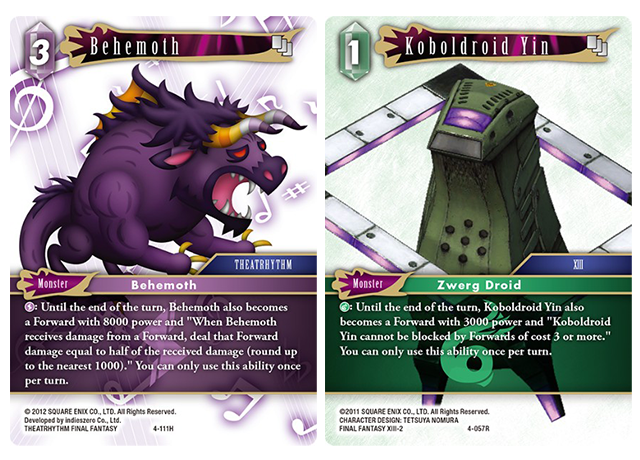 First, you have the Forwards, cards that generally depict the protagonists or other characters in their party. These are the damage dealers, the lead players in battle. 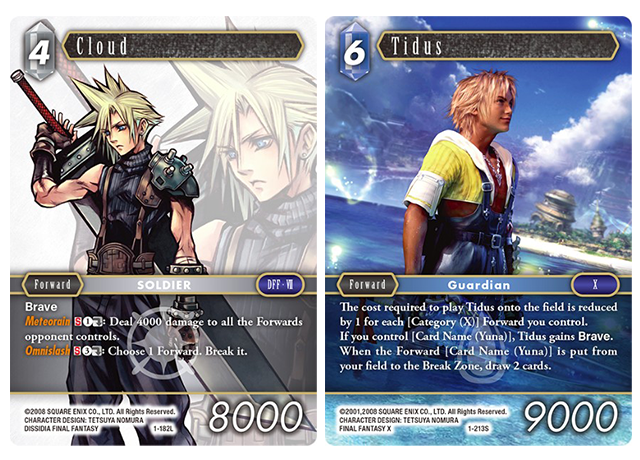 Cloud from FFVII and Tidus from FFX are featured as Forwards. Next, you have the Backups, cards that support other cards. These depict the casters in the back row or vital characters who don’t fight in battle. Tama and Enna Kros from WORLD OF FINAL FANTASY are featured as Backups, as well as Chaos and Cosmos from DISSIDIA FINAL FANTASY. As Chaos appears in DISSIDIA 012[duodecim] FINAL FANTASY as an enemy, he’s also featured as a Forward. ――I see! So their roles in their respective games are carried over. That can’t be done without extensive knowledge of the series. Definitely. I decide which character does what, so I’ve familiarized myself with all of the FF titles including the mobile games. 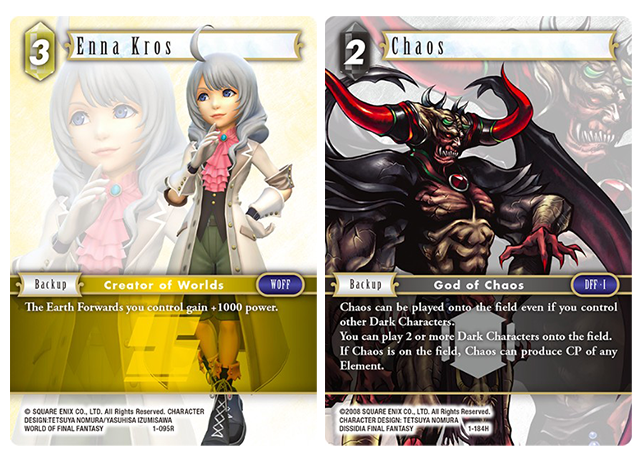 I try to keep their respective roles and relationships with other characters when bringing them over to FFTCG. I’m currently playing FINAL FANTASY BRAVE EXVIUS and MOBIUS FINAL FANTASY. ――What are the other two types? 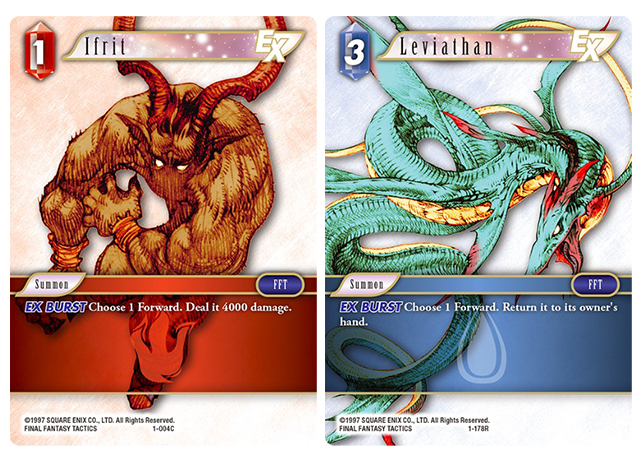 The third type, Summons, are cards that allow you to call forth familiar summons from the FF series. Their abilities are based on their original powers. For example, Ifrit deals a set amount of damage, like he does with Hellfire, while Odin has a single, powerful attack. The nature of card games makes it difficult to completely reproduce the effects of the original games, but we try to preserve the same image wherever possible. Lastly, you have the Monsters. They generally can’t attack opponents directly, but they can affect other cards in various ways. For example, a Bomb can self-destruct and deal damage to those around it. ――Which card is your favorite? The Emperor (Forward). The first game I played in the series was FFII. The Emperor appears as the last boss, and you defeat him once, but he comes back. We recreated this in FFTCG. If he’s defeated, you can pull another Emperor card from your deck. It’s a personal favorite, and he’s generally in the deck I carry around (laughs). ――So it’s a recreation of FFII’s final boss battle. The Emperor seems like quite a powerful card, but how are the cards balanced in terms of strength? Are protagonists and final bosses stronger than the others? Maintaining balance is a vital aspect of card games, making it impossible for a certain handful of cards to be much stronger than the rest, but the main characters do tend to have powerful abilities. The development team prioritizes balance first and foremost, and I come in and add elements of the FF games. We argue. A lot (laughs). ――I’d love to see more cards like the Emperor that carry over their story! Sure! Here are a few. This is Wol from MOBIUS FINAL FANTASY. Wol is a Warrior of Light, but in the story there are others (other players) who have the potential to also become Warriors of Light. 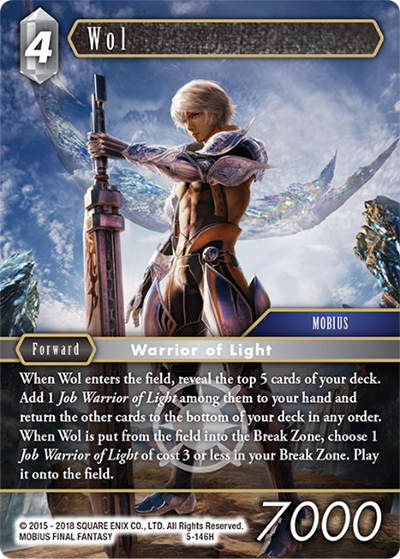 This card was created to allude to the fact that there are others; the latter ability states that another Warrior of Light will take Wol’s place if he’s defeated, carrying over the setting from MOBIUS FINAL FANTASY. 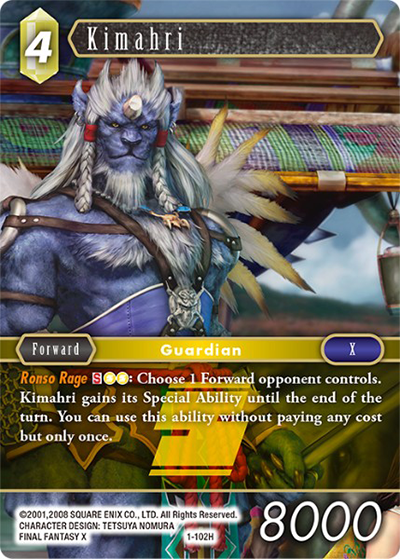 This is Kimahri from FFX. In FFTCG, he has the power to copy opponents’ abilities, just like in FFX. However, it only works if opponents’ cards have a special ability, so this card is one that’s not often used, though the character’s original trait is well portrayed. 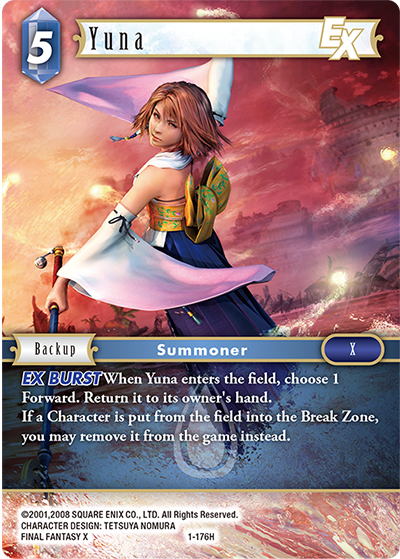 Also from FFX is Yuna, a card that’s most faithful to the original game. Generally, when a character card is defeated, it’s moved from the field into the Break Zone, but she instead removes it entirely from the game. This represents FFX’s Sending, a ritual she performs to guide the spirits of the dead to the Farplane. It’s one of the best abilities in FFTCG, and I’ve seen it often used in tournaments. ――What happens if you pit her against the Emperor? Good question! The Emperor won’t be able to come back onto the field, as he’ll be removed entirely from the game. 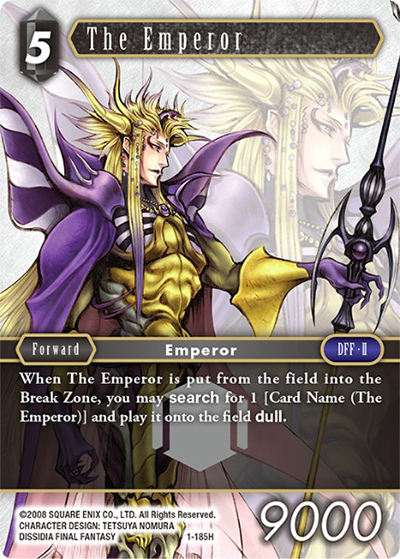 ▲ The Emperor can be resurrected if he’s put in the Break Zone, but Yuna prevents him from ever reaching that zone. A true nemesis! ――Who would’ve thought the Emperor and Yuna would become nemeses! What are some Summon cards? FFXIII has interesting ones. For example, Odin and Lightning are a set, so when you play Lightning, you’ll also gain Odin. Just like in the original game, the characters have their own summons: Lightning has Odin, Vanille has Hecatoncheir, and Hope has Alexander. Their abilities are also linked with their summons. 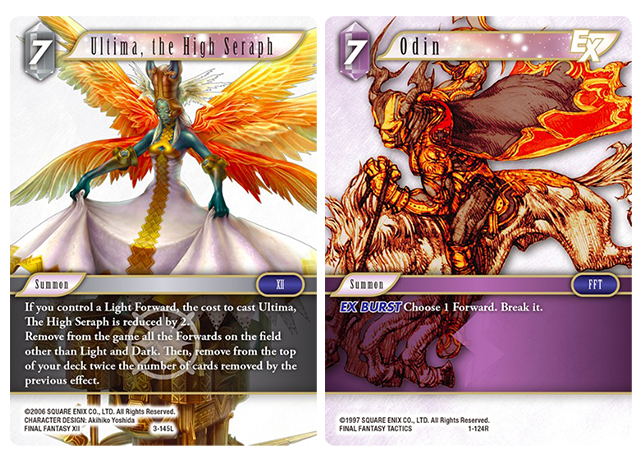 Not only that, Odin from various FF titles is featured in FFTCG. 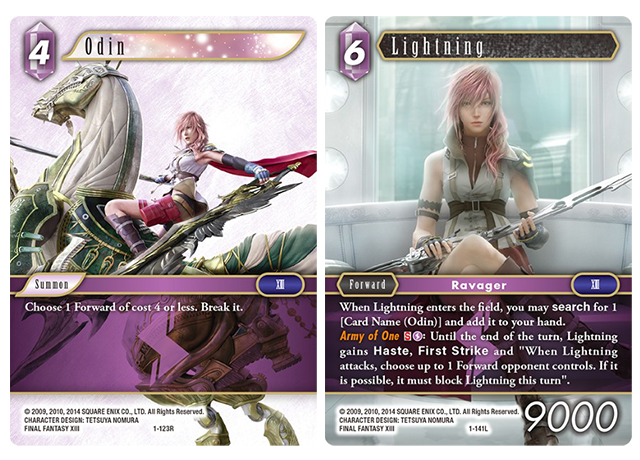 Lightning’s abilities apply to all of them, allowing her to summon Odin from not just FFXIII but other titles as well. ――So her powers exceed those from the original game. What are some Monster cards? 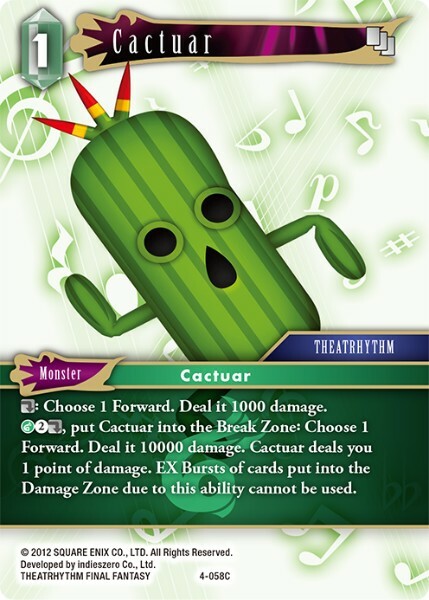 This is the Cactuar card. It can deal 1,000 or 10,000 damage to the opponent. That’s right, 1,000 Needles and 10,000 Needles were taken straight from the series (laughs). ――Thank you for introducing these cards! Now that I have an idea of what the game is like, how do I get started? We created a browser-based tutorial, an easy way for people to experience the game. It teaches you the rules step-by-step. Please give it a try! ――There seem to have been all kinds of events held in the past! Which was the most memorable? I’ve already mentioned that FFTCG is played overseas, but we set up a space at Japan Expo in Paris, France, a large convention introducing Japanese culture. People gathered around, curious as to what this game was, and many showed great interest. ――Card games are a different experience than digital games in that they’re about socializing and playing with other people. What is the appeal of analog games? Gathering together in person is a big point of appeal. With digital games, you play with people you can’t see. I feel like there’s value in getting together to enjoy what essentially becomes a party. What’s interesting is that players seem to be creating teams. Of course, battles are played one-on-one, but people seem to enjoy entering tournaments with other team members. If one of them makes it through the ranks, they all cheer. If they lose, their team comforts them. Everyone gets really into it. ――That’s interesting. So players develop their own communities. Yes. Sometimes communities come up with their own unique strategies, which they’ll share with only members of their own community. They’ll try it out during tournaments, and while it doesn’t always go well, when it does, there’s a triumphant celebration. The process of coming up with a new strategy together is one of the best things you can experience through FFTCG. I’m sure everyone remembers going to a friend’s house as a kid and hanging out with friends. That’s what this is like. As adults, I want you to remember that feeling and hang out with your buddies and have fun playing FFTCG! ――Hanging out with fellow FF fans sounds like a blast! Thank you so much for sharing with us today! The Opus VI collection is available from Friday, July 13th! 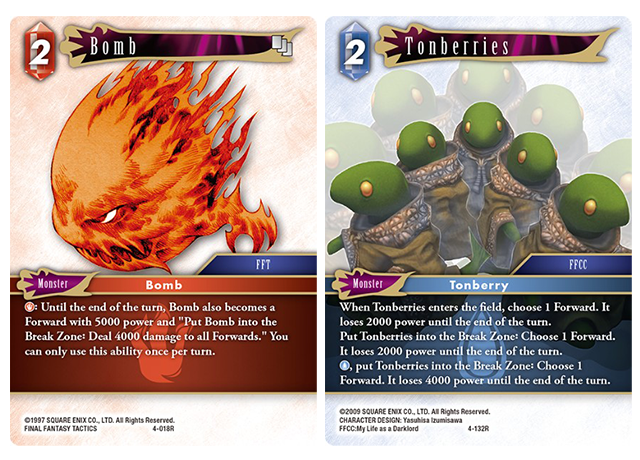 Here’s an FF Portal exclusive sneak peek at three of the cards, including ones with FFTCG original designs! We received comments from Mr. Kageyama, as well as the illustrators! This was drawn for FFTCG by Roberto Ferrari, one of the artists involved with the original character design for FINAL FANTASY TYPE-0. He designed five cards for this collection, including Kurasame. 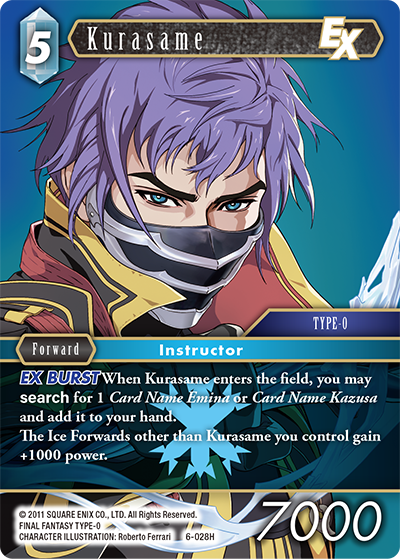 Kurasame’s nickname is the Ice Reaper, so it’s only natural his element is ice. Once played, he can search for his former classmates Emina and Kazusa. As a commanding officer, he has the ability to strengthen other Forwards (+1000). He can search as soon as he enters the field, which basically brings his cost down to 3CP with 7,000 power. The cards he can search for are Backups, a reliable addition to cards in play. As ice types don’t have a lot of power, his abilities are best used to boost other Forwards. 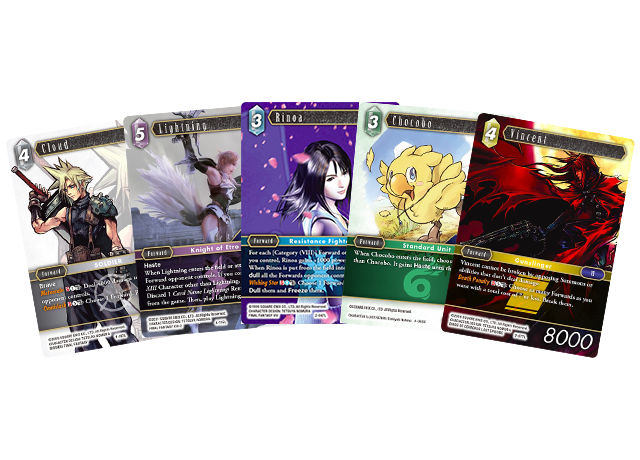 When I was asked to illustrate these FF TYPE-0 cards, it hit me that it’s been a decade since the characters were created (laughs). During the past ten years, they’ve gained popularity, especially Kurasame, who’s been featured in a manga and whose fans I’ve met cosplaying him at events. It’s almost like watching my own children grow up, and there’s no greater feeling as a designer; I can’t thank you enough. I hope you get your hands on this card and keep the characters alive in your hearts. As this year is the 30th anniversary for FFII, we wanted original designs for FFTCG, which we gratefully received from the art director of MOBIUS FINAL FANTASY, Toshitaka Matsuda. 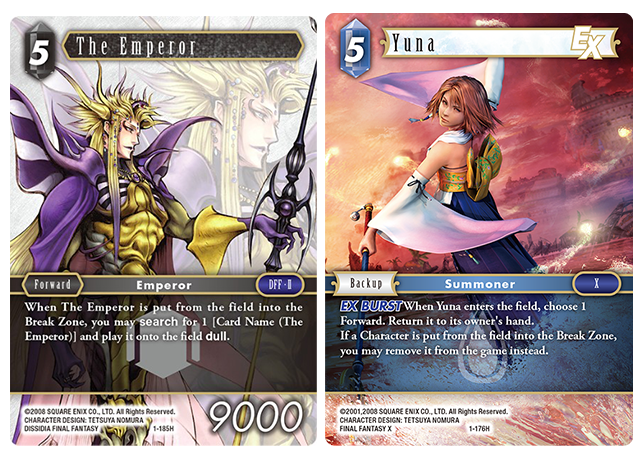 In the new Opus VI collection, there six FFII cards as well as a few others with FFTCG-exclusive designs; it adds up to quite a lot of new cards. As FFII was the first FF game I played, I put a lot of energy into this! At a glance, with 1CP and 8000 power, Leon looks quite impressive (laughs). He has a rather unique ability; when he enters the field, your opponent gains control of him. But if you play an FFII character card, you regain control. This is what his character goes through in the original game. He starts off in the protagonist’s party, but leaves and becomes a Dark Knight, appearing later as an enemy. At the end, he rejoins forces with the protagonists. He has a lot of power and considerably low CP, so it’s best to keep a low-cost FFII character card in your deck to cover your bases. 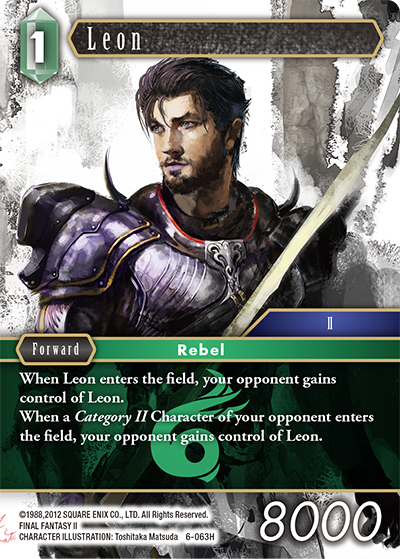 Make the most of Leon by pairing him with a card that has an ability determined by cost, such as Shemhazai, the Whisperer (2-070R). My memory of FFII is coming home from school as a kid, throwing my backpack on the floor, switching the TV to channel 2, and turning on my NES, completely losing myself in the game. FF felt like such a grown-up game, and I can still remember my excitement as I played through the late afternoon. At the time, depicting large towns and treasure chests with pixel art and perspective was unheard of, and through it I sensed the dedication and detail that went into the game. The series already felt like it had far exceeded the rest. The original pixel art made it possible to convey Leon’s dark side, his inner conflicts, and his complex storyline, as its simplicity allowed players to use their imagination. I definitely had more of a challenge, but I illustrated Leon with his sins, his triumphs, his struggles as a man, and the reasons behind his chosen path in mind with every stroke. I had a lot of fun because this wasn’t concept art or publication material or character models, I was asked to illustrate the character as I see him. I was reminded of how much I enjoy creating art with my own unique touch, daring to be as bold as I want to be. Garland’s job is a knight, just as he was a knight of Cornelia in FINAL FANTASY. Formerly a noble knight, his abilities faithfully depict his loyal nature to protect the princess at all costs. His special abilities are borrowed from DISSIDIA FINAL FANTASY. This card is fairly rare as there aren’t many cards with two special abilities. Though his ability may seem tricky to use as it requires control of a card with a specific job, you should have no trouble building a deck with fire and water types. His special abilities are quite powerful; use this card aggressively. And that’s all for what’s new in the world of FFTCG!